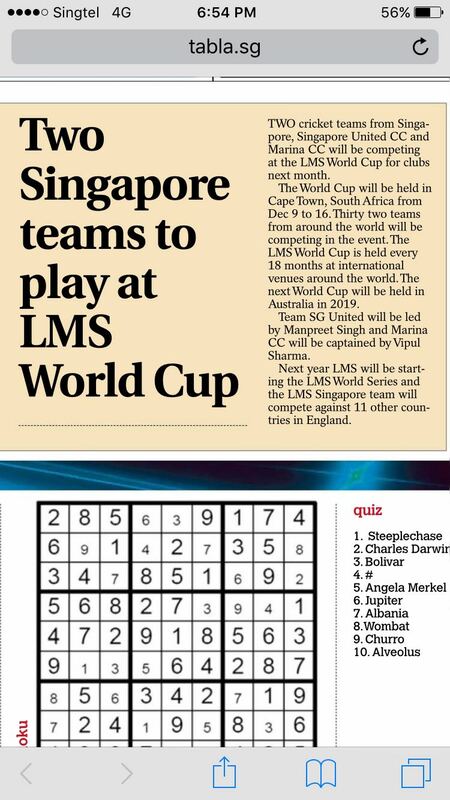 Singapore United CC and Marina CC from LMS Singapore have been in the paper recently celebrating the two teams Qualifying for the Last Man Stands World Champs. Congradulations to both teams we'll see you in South Africa. 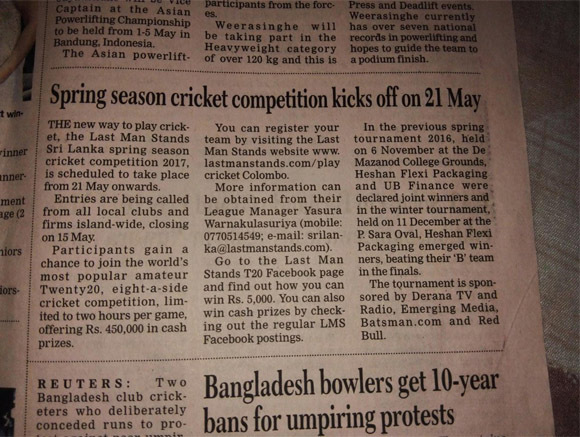 Last Man Stands has been in the news papers in Sri Lanka the last few weeks as the 2nd LMS Colombo season starts. Good luck to all players and teams taking part this season! A TEAM made up primarily of Tamil Asylum seekers will on Friday battle it out at the SCG for a prestigious inaugural trophy named in the honour of the late Richie Benaud. 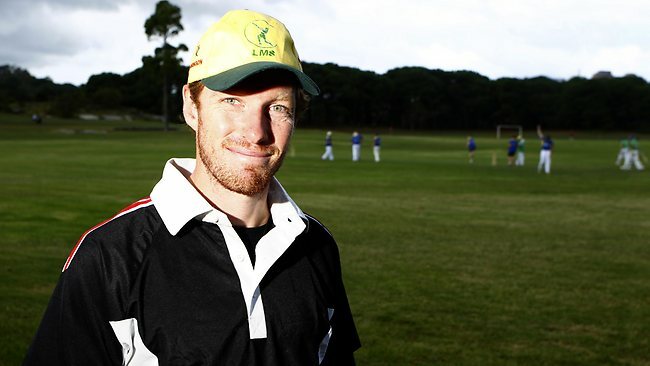 Suburban cricket powerhouse Ocean 12 is an extraordinary cricket side featuring at least 12 players who have served time in detention centres and are now out on temporary visas and in many cases unable to work, have made cricket their life. 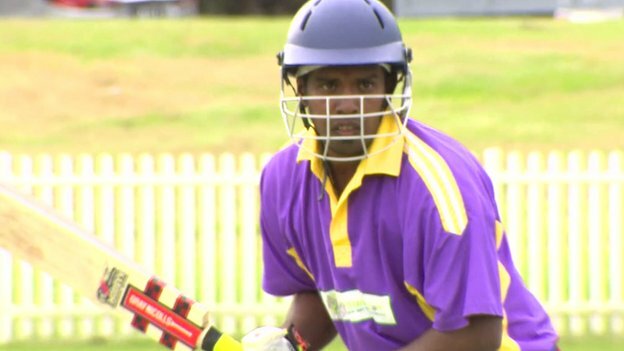 A group of Sri Lankan asylum seekers have claimed victory both on and off the cricket pitch. 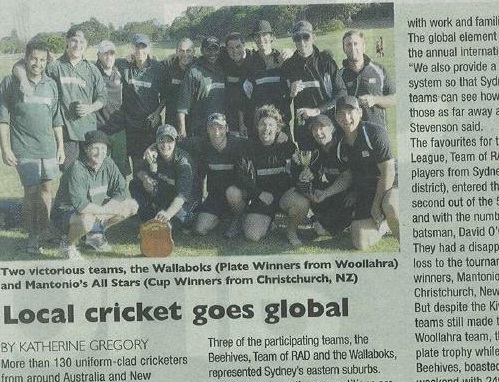 The team was almost in tears after winning a national Twenty20 championship at the Gold Coast on Wednesday night. 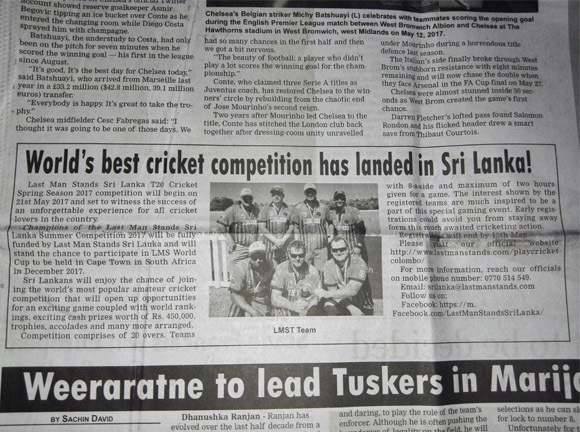 The Tamils in the team, Oceans 12, have come a long way from thwarted attempts to play their national game inside some of Australia's immigration detention centres to now winning the semi-professional tournament run by Last Man Stands. But player Purusothaman Srinivasan said the team has maintained its focus on the game, more than the prize. "When we are winning, our mind is happy. If we are losing, we go back to think about what is our problem," Mr Srinivasan said. The 36-year-old said he left Sri Lanka to Malaysia in 2008 because of war and ethnic violence. 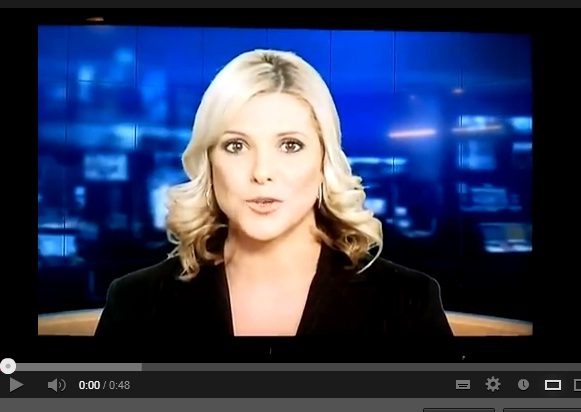 Catch the full story by ABC News by clicking HERE. 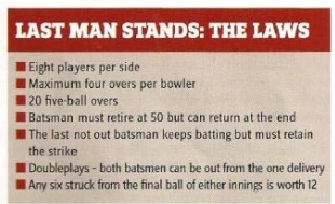 SKY Sports features Last Man Stands during the 2016 England Champs. This is the tournament for you. 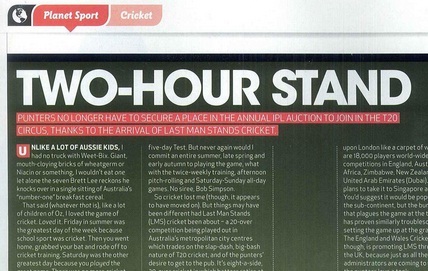 Last Man Stands takes the form of an eight-a-side T20 thrash designed to provide exciting cricket in half the time. 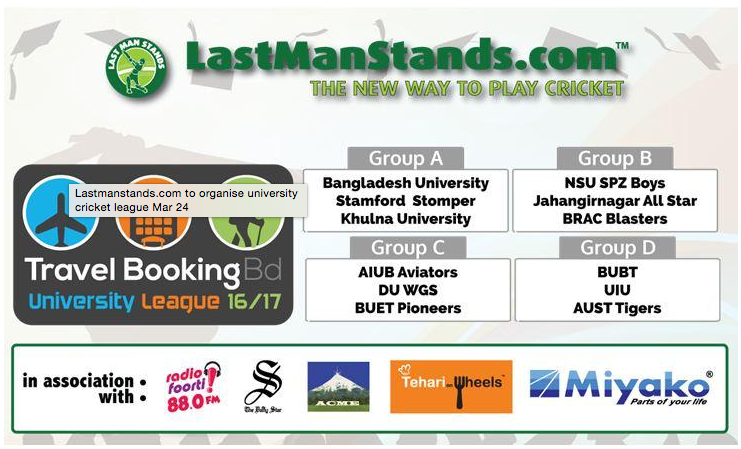 Dubai Islamic Bank won the unique T20 cricket league Last Man Stands (LMS) Dubai held in the UAE for the first time. 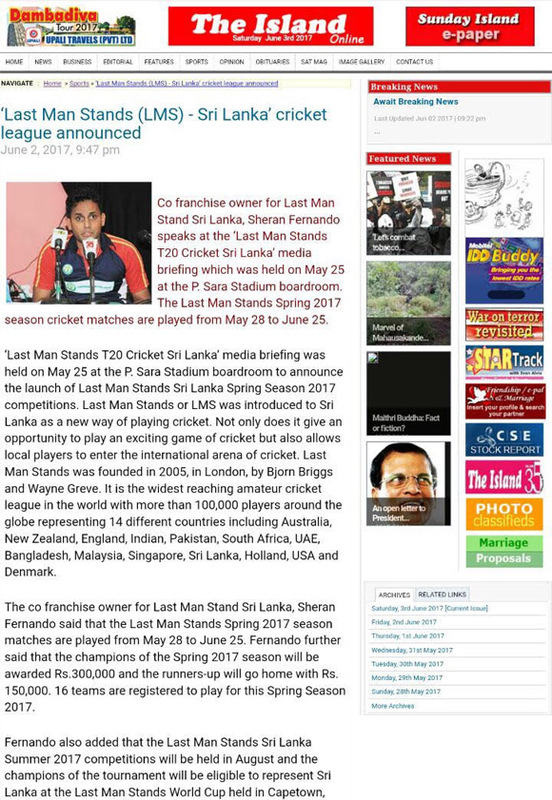 The Emirates Cricket Board (ECB) and Dubai Cricket Council (DCC) have endorsed the staging of Last Man Stands UAE in Dubai and support spreading the leagues out to the other emirates in 2016, to encourage the growth of amateur cricket in the UAE. Click HERE to read more. 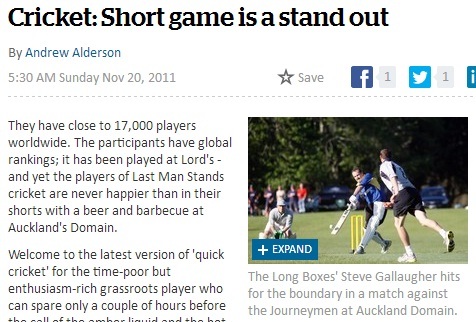 "My opinion is the game needs to offer more formats to take into account people's lifestyles. It is great to tweak the existing player base but if we want to grow the base we need to speak to our 10m fans and say what format would you want to play? That is the role of participation and growth. 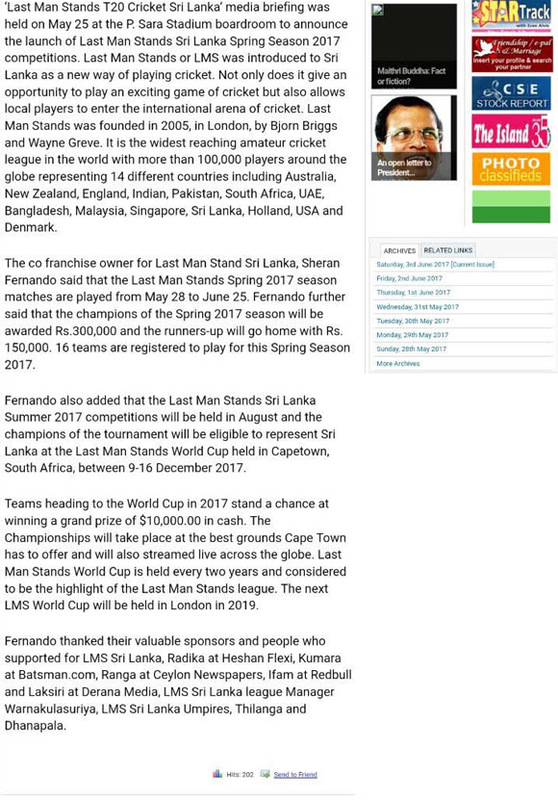 What do we do to further stimulate Last Man Stands, which showed 20% growth last year, or influence clubs to say it's okay to have a T20 side? If the clubs aren't responding quickly enough to people's needs then we need to make a call about what to do." 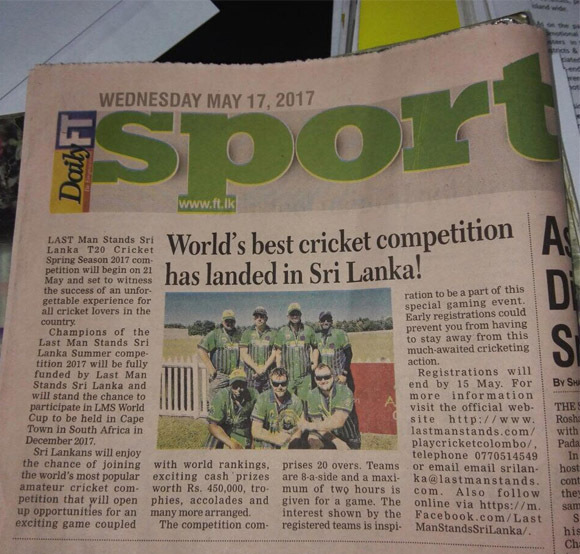 A shared love of cricket is helping a team of Sri Lankan asylum seekers break down barriers and build relationships in Australia, even among some of the most fervent supporters of the country's hardline immigration policies. 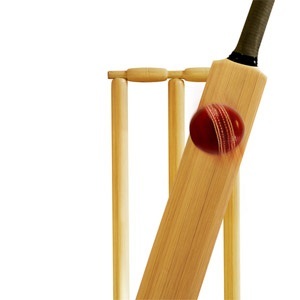 Johannesburg - The sound of leather on bat can be heard at the Zoo Lake Sports Club in central Johannesburg, with a fielder in hot pursuit of the ball as it speeds to the boundary. This particular fielder however, and the team he plays for, are unique for reasons beyond the game of cricket itself. 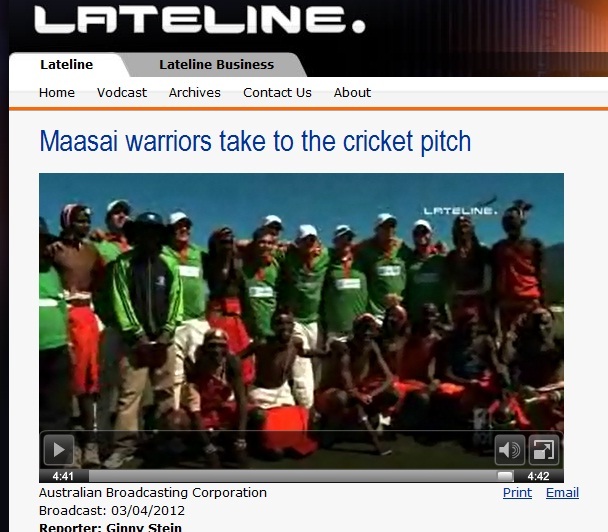 "The Maasai Cricket Warriors is the warriors' team. 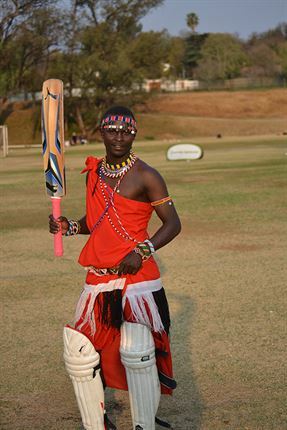 We play cricket and we play with our traditional clothes," captain Sonyanga Ole Ngais told News24 prior to them squaring off against local teams in two Last Man Stands (LMS) friendlies. Click here for full article. Kevin Ferrie takes us through his first experience of Last Man Stands at the inaugural Edinburgh Open 2015. As the tournament ended, an anxious wait got underway... 37 years after playing my first club game a world ranking was at last in the pipeline. Click here for the full article. 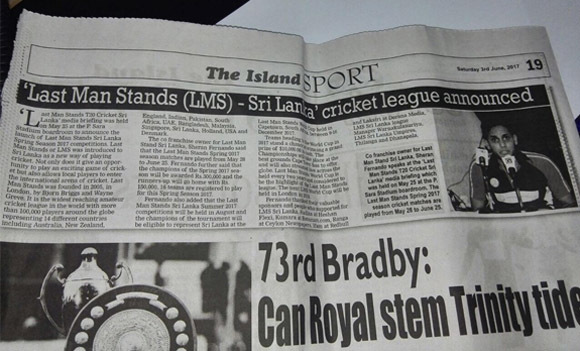 This year will see LMS host its fourth World Championships, taking place at the world renowned Kensington Oval in Barbados. "We're really excited about that. It's our fourth World Champs and it's also our 10 year anniversary of running LMS," Briggs says. The BCA have been "incredibly supportive" in getting behind the event, which will feature a total of 32 teams from around the world. 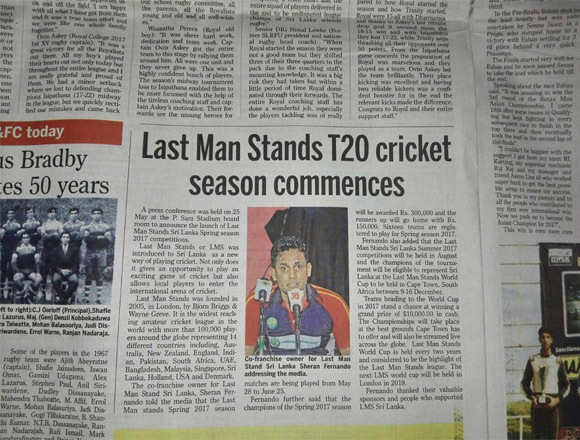 Twelve come from LMS's different regions, while 20 local teams are expected to take part. 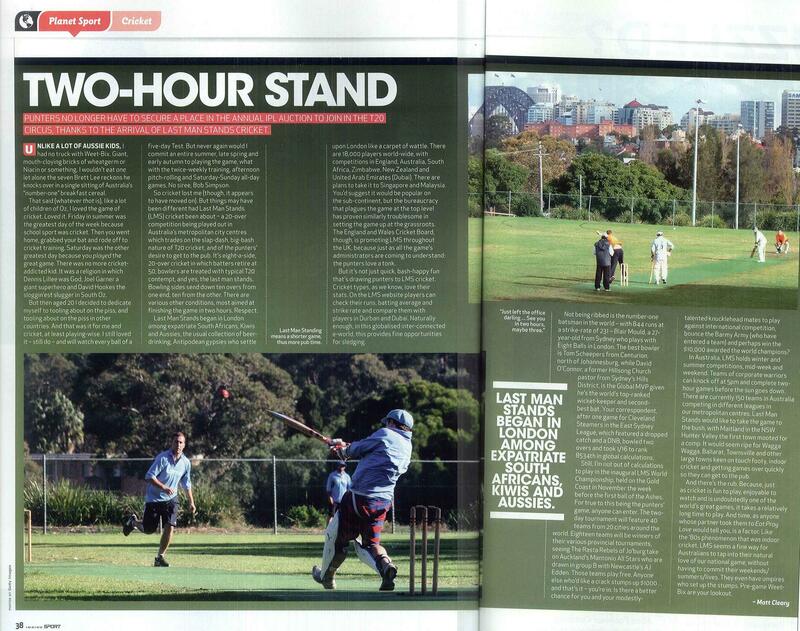 ICC Cricket 360 piece featuring the 2013 Last Man Stands T20 World Championships at the home of cricket, Lord's in London. 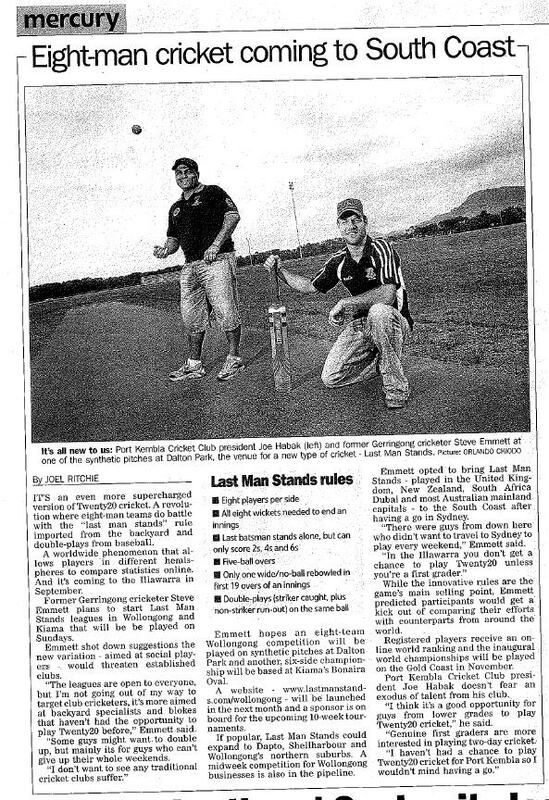 This program aired in over 100 countries globally and focuses on the opening day of the tournament which featured all the national champions, plus the charity element of Last Man Stands, including the fantastic Maasai Cricket Warriors! 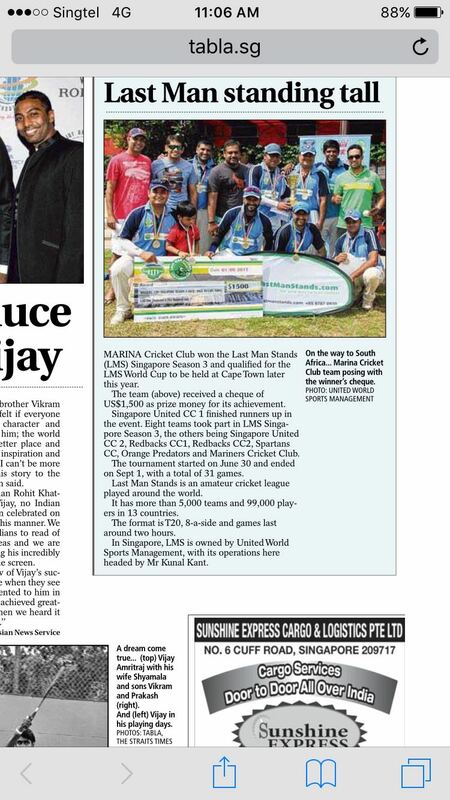 Great story in Australia's Sydney Morning Herald about Last Man Stands Ocean 12 Tamil Asylum Seeker team, who have taken the Western Sydney leagues by storm since new year. 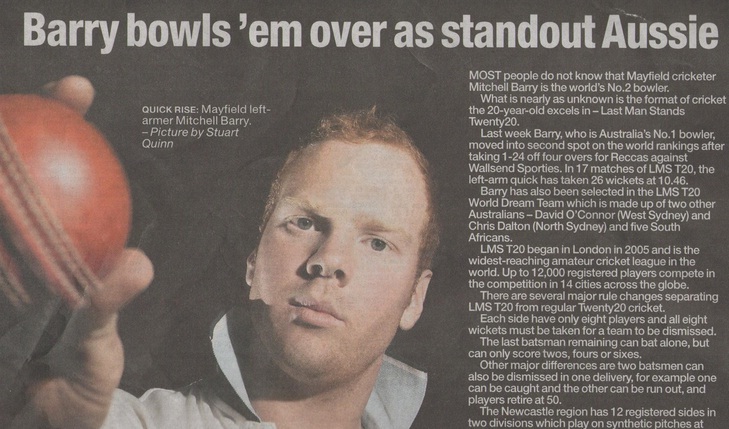 The team grew out of LMS running matches inside the notorious Villawood Detention Centre, which brought the comp to the attention of the Blue Mountains Refugee Support Group. 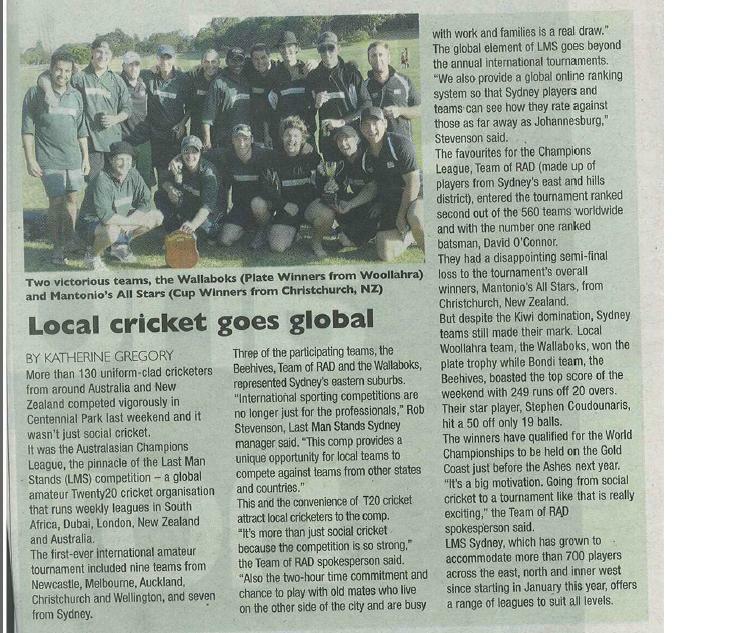 Could a team of Asylum Seekers be the next Sydney (or Australian) Champions?! 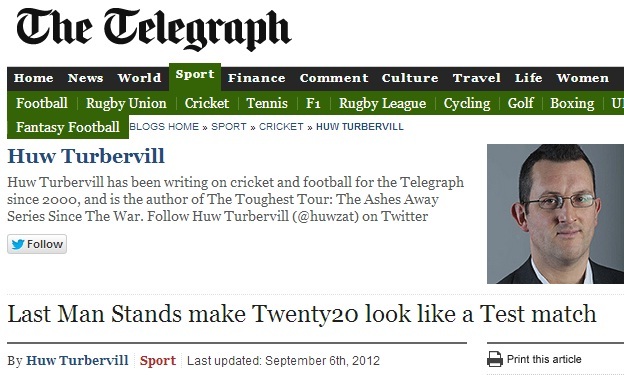 What an unbelievable story that would be! 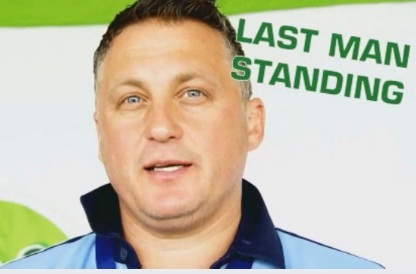 Watch a great Cricket AM feature on a Last Man Stands challenge between England and Australia at Lord's - captained by Darren Gough and Ian Harvey. 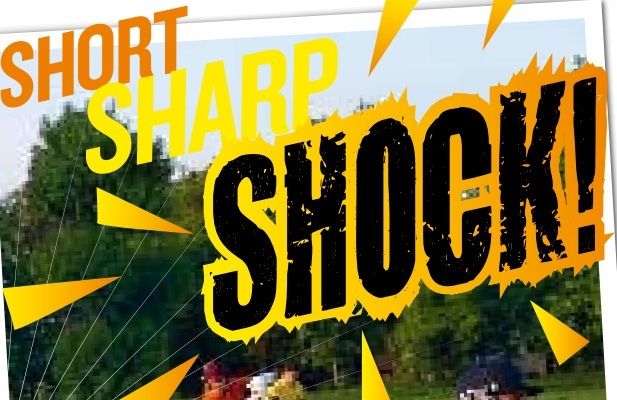 Top ranking players and other lucky competition winners got the chance to play under each of the former Ashes rivals in a match, with the cameras of Sky Sports close in tow! 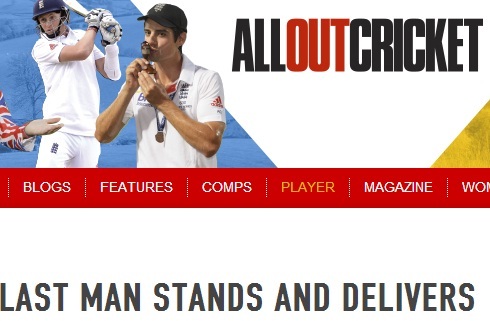 With increased support from the ECB and an ever-growing number of players, Last Man Stands is evolving from a niche form of the game based primarily in London to a viable, country-wide alternative to weekend cricket. 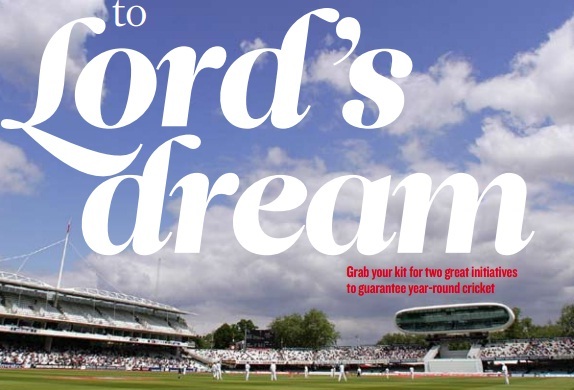 We popped along to Lord's to take in the World Championships and to track the competition's progress. 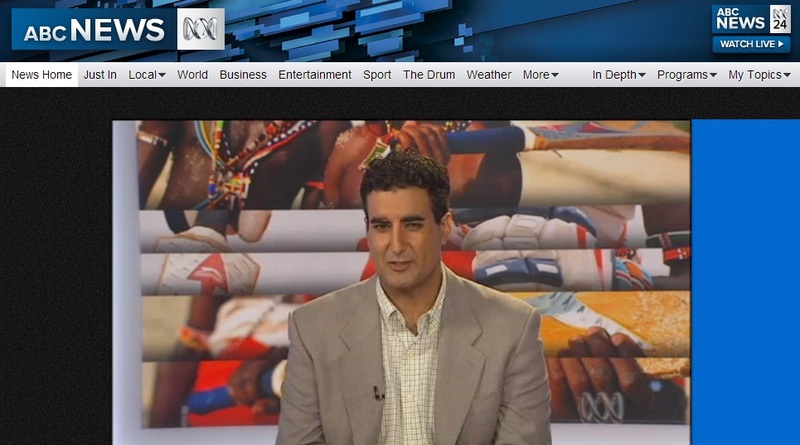 ABC TV interview about how Last Man Stands T20 cricket is helping more disadvantaged people access the sport, including a discussion on global charity efforts such as the Maasai Cricket Warriors and the Johannesburg township team, as well as efforts to raise money through the Australian leagues to help people with disabilities access the sport. 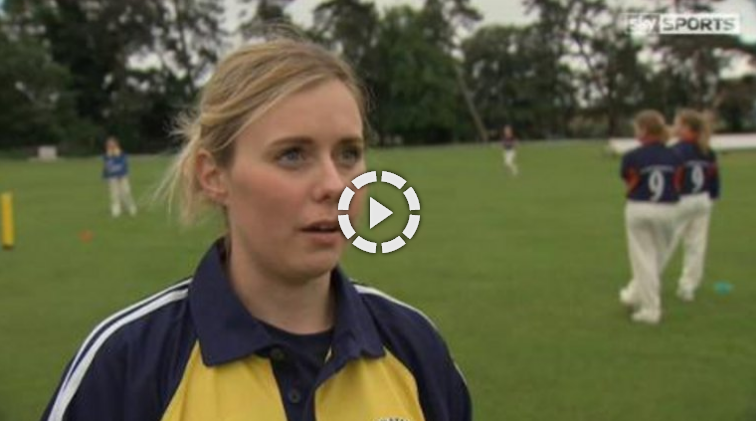 Jeremy Casey and his LMS team, Dreadlock Holiday CC, are interviewed on Sky Sports TV show - Cricket AM. 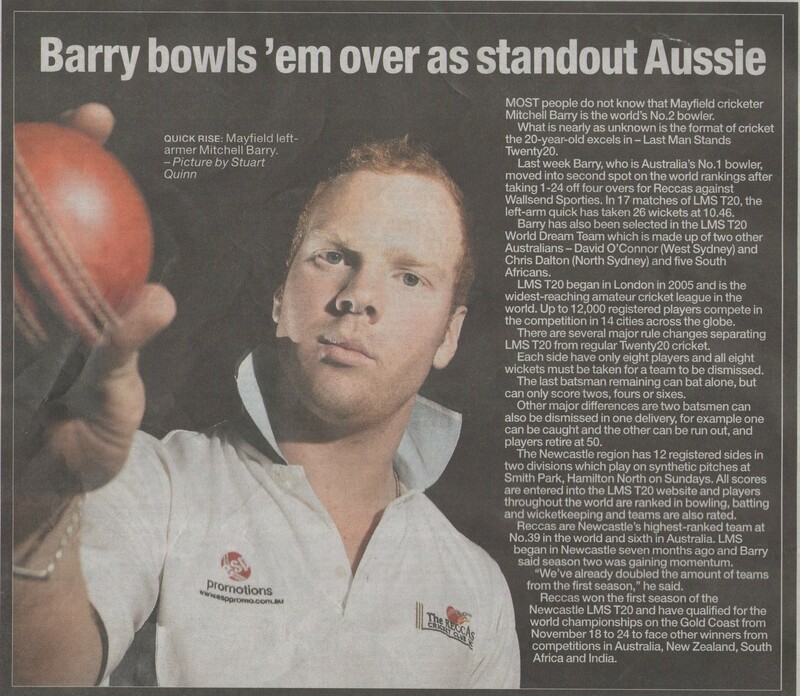 Casey is one of the top LMS players in the world, averaging 99 with the bat at a strike rate of close to 200!! 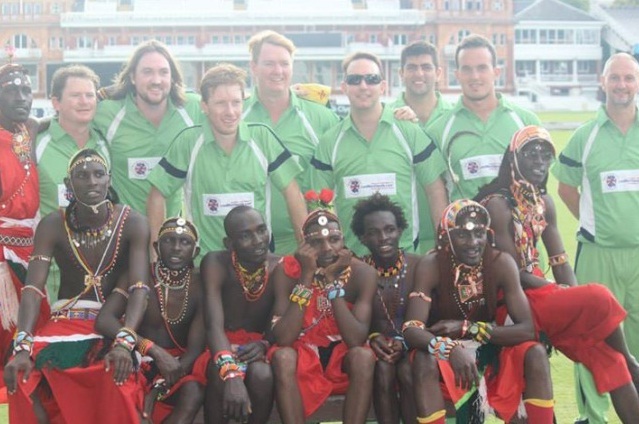 A team of Maasai Warriors is playing at Lord's this week in the final of an amateur cricket world championship. 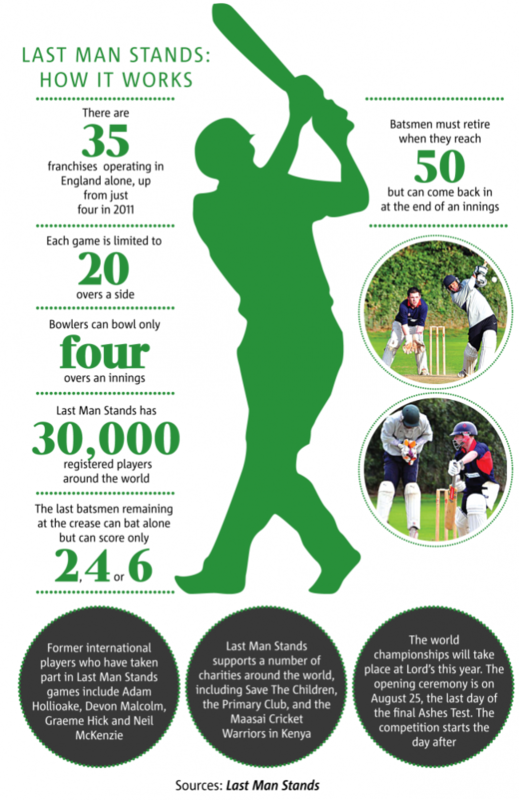 The Last Man Stands World Championship reaches its climax at Lord's this afternoon, with a £10,000 prize up for grabs. Four teams will play in the finals of the tournament, which is being hosted by England and Wales Cricket Board (ECB) for the first time and has featured 48 teams from five different countries. Mnr. 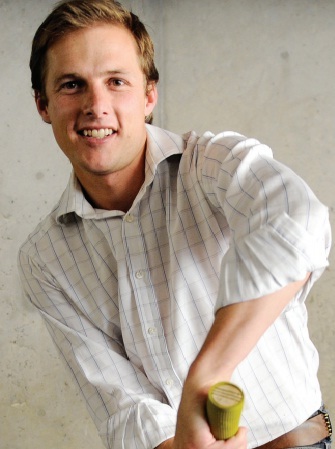 Bjorn Briggs (34) het nog altyd 'n passie vir krieket gehad. Hy en sy vennoot, mnr. Wayne Greeve, wat op skool saam vir die eerste span krieket gespeel het, het daarvan gedroom om vir Suid­Afrika krieket te speel. Briggs sÃª egter hulle het vinnig besef dit gaan nie gebeur nie ennadat albei hul universiteitstudie voltooi het, het hulle die pad Enge­land toe gevat vir 'n paar jaar. 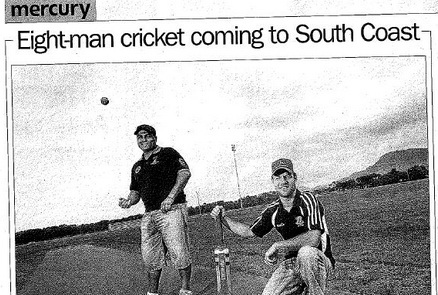 WIN News report about Tradies you can't trust's triumph at the 2011 Australian National Championships, on the South Coast of NSW. 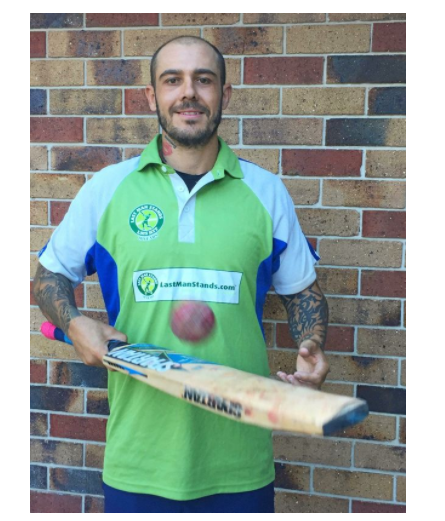 Tradies beat Power House from Melbourne in a one-sided final to book their tickets to the 2012 World Championships in Cape Town! Five balls an over, eight people per side, extras worth three runs and a €˜double play' rule where both batsmen can be out off the same ball. 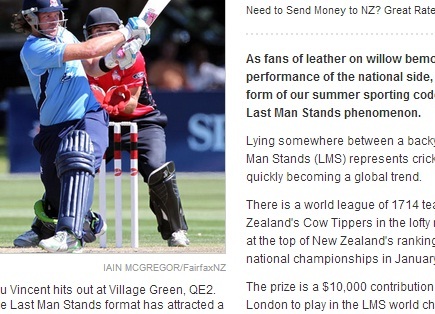 What in the name of WG Grace is all this? This is Last Man Stands, the latest format of a game that's gone through more changes in the past decade than it has in the past two centuries. Primarily played in parks in the early evening, the game is growing in popularity among a large group of enthusiastic players keen to get back into the game.